Dr. 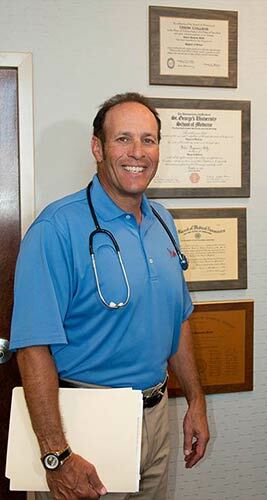 Rob Stoltz has been a practicing Board-Certified internist in Baltimore County for over 30 years. He received his undergraduate Bachelor of Science Degree at Union College, Schenectady, NY. He attended St. George’s School of Medicine and received his clinical training at Greater Baltimore Medical Center (GBMC). He was the Chief Resident of Internal Medicine at GBMC until 1986, when he opened his private practice. Dr. Rob Stoltz continued to serve the Baltimore community as the Staff Physician Volunteer at the Maryland Special Olympics, a Board Member for Baltimore County YMCA and Attending Physician for the United States Golf Association and the Champions PGA Tour. In 2006, Governor Robert Ehrlich awarded Dr. Rob Stoltz a commendation for his ‘Excellence in Medicine’ and his service to the Baltimore community and the citizens of Maryland. Currently, Rob serves as the chairman for the GBMC Classic Golf Tournament, which raises funds to benefit the patients at the hospital. In his 18-year tenure as chairman, the tournament has raised in excess of $3 Million. He lives in Lutherville with his wife Cynthia and their two yellow labs, Maggie & Daisy.